As the world hesitantly emerges from recession, the one question that seems to be on the lips of investors everywhere is: what’s next? As the tragedy continues to unfold in the Gulf of Mexico, with no fix in sight, market attention has suddenly shifted to the energy sector after years of neglect. Pundits and would-be energy experts are a dime a dozen. Speculation about oversold or underbought oil abounds. But the real profits in energy won’t be made anywhere near the Gulf and have little to do with going long or short on BP or Transocean. They’ll come from being the first to arrive on the newest scene, getting there before the crowds do. The current economic climate has opened up doors to some exciting opportunities around the world. Discovering which of these is going to be the next big winner, however, can be quite the challenge. A question that our subscribers ask us time and again is, “What is your secret to consistently picking winning stocks?” As seasoned resource investors, our answer today is the same one that company founder Doug Casey has been giving for decades. It’s what he calls the “8 Ps” of resource stock evaluation. The 8 Ps are: People, Projects, Paper, Promotion, Push, Phinancing, Politics and Price. They form the basis of the job interview that any Casey stock recommendation must go through as part of the due diligence we perform. These criteria let us look beyond a few numbers, deep into the real fundamentals of a company. But even before we turn our attention to individual companies to select the few gems that we include in our newsletter, we concentrate our efforts on finding the niche in the energy market that is about to explode. Then we can sort out who is most likely to exploit that niche. We’ve traveled the world, and we believe we’ve found the most promising area for oil exploration. Africa might be the final frontier, the last place left on Earth where elephant deposits – very large oil and gas reserves – remain to be found. This makes Africa a central piece in the world energy matrix, and the area is getting some major attention. When oil and Africa are mentioned in the same sentence, thoughts automatically jump to oil rigs dotting the landscapes of Nigeria and Libya. But the ship has sailed for West and North Africa – their oil fields are either producing or about to come online. Anyone looking at buying into the energy mammoths operating there will find it just too dear. East Africa has been largely ignored since early drills, almost 50 years ago, came up dry. But then Irish oil giant Tullow discovered over 2 million barrels under the waters of Lake Albert, Uganda, in 2009, and the region suddenly shot into the limelight. Now some of the biggest players in the field are jostling each other to get in on the action. France’s Total SA, China’s CNOOC (China National Offshore Oil Corp), and Ireland’s Tullow are only three of the energy titans wooing governments and smaller companies. Just days ago, on June 2, Afren bought out Canada’s Black Marlin Energy, in a US$100M deal that gives the formerly West Africa-focused British producer a significant foothold in the east. But East Africa is anything but a cakewalk. Poor governance, limited rule of law, and a severe lack of transportation infrastructure are just some of the problems that companies looking to do business there are facing. Additionally, unlike West and Northern Africa, which have a complex network of pipelines, East Africa has only two. With the Lake Albert discovery, another pipeline is being built by some of the major companies in the region, but it won’t be operational until 2011. Violence is also a serious threat. Quite a few militant groups are active in the region, attacking oil rigs and pipelines, kidnapping foreign oil workers. And the operations of pirates in the Gulf of Aden are well documented. Nor is political stability a given. Mogadishu, in Somalia, still remains a no-go zone. Parts of Ethiopia are plagued by rebel insurgencies, and the country is at war with Eritrea. Even Kenya, a model of governance by African standards, has simmering ethnic and political grievances that could erupt at any time. In short, the threats to both body and business often impede a firm’s ability to function, let alone continue exploration and production in the region. If it’s so bad there, then why is East Africa one of our top picks for 2010? There’s an old Chinese saying, “If you don’t go into the tiger’s den, you won’t get the tiger.” As we’ve proved in the past, a high-risk project is by no means an automatic guarantor of failure. After all, this is only picking the sector... if a company sails through the Eight Ps, the potential reward can outweigh the risk. As an example: When we identified renewable energy as the sector to watch in 2008, our recommendation was a high-risk play. Reservoir Capital, a hydroelectric company, had acquired some viable projects in Serbia, a country with great geology for hydroelectricity. But how stable was Serbia itself? They had just lost a war, Kosovo’s declaration of independence caused the coalition government of 2008 to collapse over a weekend, and anti-Western radicals seemed poised to win the elections. It looked grim. Yet we reasoned that no matter which party won, people still would need jobs. In a country starved for power, a company that was already open for business, with good prospects, was miles ahead of the competition. 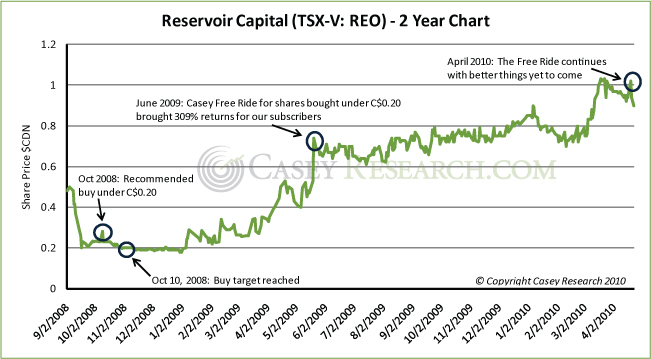 Not to mention that Reservoir had balanced its position by putting its fingers in a couple of mineral deposit pies as well. Like Serbia, East Africa is certainly an intimidating prospect, but that doesn’t mean investors should stay away. Better technology, higher world oil prices and decreased risk in some of the countries (compared to 20 years ago) have turned the scene on its head. 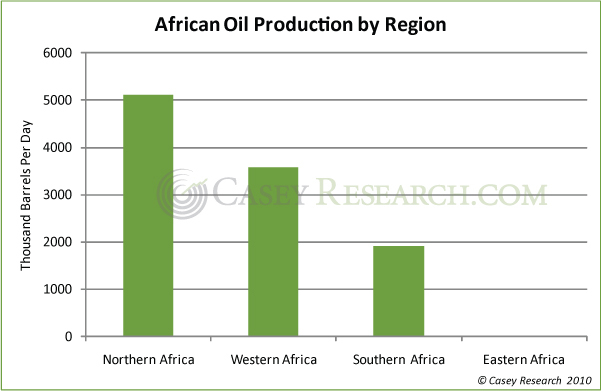 Realistically, only five other regions remain where an oil elephant may be found, and they all have their problems. The Gulf of Mexico is going to be hit with tighter regulations. Iraq and Iran are crippled by terrible royalty structures. West Africa and Brazil are restricted to the big boys, since new fields are so costly to bring online. For the smaller fry in the oil industry, the area represents their best chance to get in on the ground floor and reap potentially huge rewards in the future. For the government players, East African oil can generate much-needed cash, as well as help meet their nations’ rising energy needs. And for the majors, a shiny new market is opening up. This corner of the world is elephant country in more ways than one. It is, in our opinion, the place to watch in the near future. But not everyone will hit the energy jackpot, of course. In East Africa, as elsewhere, it’s survival of the fittest, and our job is to determine who’s most likely to come out on top. Marin is the senior editor of Casey’s Energy Report, focused on discovering outstanding small-cap opportunities in the energy sector, such as the ones mentioned above. And he’s simply the best at it. It’s no coincidence that of 19 recent stock picks, all 19 were winners... a 100% success rate. Learn in this report how you, too, can profit from his expertise and spot-on instincts.